"The Brighton Motive Power Depots"
Over many years much has been written about the various forms of traction that operated in and around the Brighton area. 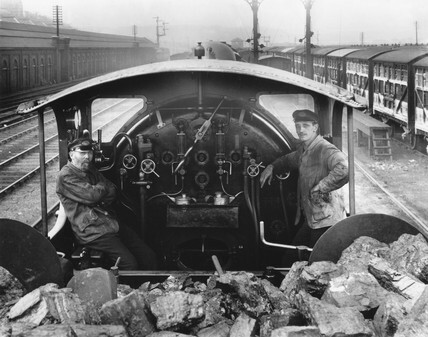 But very little has been documented about the footplate-men who actually worked on them. ASLEF – the Associated Society of Locomotive Engineers & Firemen. and it features ASLEF members who brought our Brighton trains to life. This website features stories from the footplate, and extracts from various publications. This website in conjunction with the history of the Brighton Branch of A.S.L.E.F. website, will hopefully try and explain the history of A.S.L.E.F. and footplatemen & women at the depots that have existed at Brighton and are featured on this website. Having visited this web site I hope you will not only enjoy seeing it develope but perhaps also let us share any relevant pictures you have. If you have any photos relating to this subject and you would like to share on this website. Please email them to me, a long with any relevant info about the photo (name(s) location and the year). I would also like to add to this web site any stories from your life on the footplate. If there is any information that is incorrect or have any experience any problems whilst visiting my web sites, please can you let me know so I can rectify them. If anybody has any objections to that material appearing on this website. I will only be to happy to remove such material from this site. AND NOT FOR MAKING ANY FINANCIAL GAIN. This website in conjunction with the history of the Brighton Branch of A.S.L.E.F. website, will hopefully try and explain the history of A.S.L.E.F. and footplatemen (& women) at the depots that have existed at Brighton and are featured on this website. Thanks also to Neil Cameron and his fellow colleagues from the Bluebell Railway for all their help in compiling these web sites. Many thanks for spending some time on visiting this web site. Some photographs might be slightly hazy.